We often notice differences in pronunciation between our own speech and that of other speakers. We even use differences, like the Southern pronunciation of hi or the Northeastern absence of ‘r’ in park, to guess where a given speaker is from. A speaker’s pronunciation also includes cues that tell us which social groups that speaker identifies with. For example, the way you pronounce words might give listeners information about where you are from, whether you identify with a specific cultural group, whether you identify as a man, a woman, or a non-binary gender, as well as other information. Back-vowel fronting is a particular type of pronunciation change that affects American English vowels like the /u/ in boot and the /o/ in boat. While these two vowel sounds are canonically produced with the tongue raised in the back of the mouth, speakers from across the United States sometimes produce these vowels with the tongue closer to the front of the mouth, nearing the position of the tongue in words like beat. We can measure this difference in tongue position by analyzing F1 and F2, which represent the important frequency information that allows us to differentiate between different vowel sounds. As seen in Figure 1, F1 and F2 (i.e., the dark horizontal bars in the bottom portion of the images) are very close together when the [u] of boot is pronounced in the back of the mouth while F1 and F2 are far apart when the [u] of boot is pronounced in the front of the mouth. These differences in pronunciation can also be heard in the sound files corresponding to each image. Figure 1. Waveform (top) and spectrogram (bottom) of (a-b) boot pronounced with a back vowel by a Black male speaker and by a Black female speaker, and of (c-d) boot pronounced with a fronted vowel by a White male speaker and by a White female speaker. Other studies have found fronting in words like boot and boat in almost every regional dialect across the United States; however, back-vowel fronting is still primarily associated with the speech of young women, and the research in this area still tends to be limited to the speech of White speakers [1, 2]. The few studies that focused on Black speakers have reported mixed results, either that Black speakers do not front back vowels  or that Black speakers do front back vowels but exhibit less extreme fronting than White speakers . Note that in the case of the former study, only male speakers from North Carolina were recorded, and in the case of the latter, both male and female speakers were recorded, but they were all from Memphis, an urban area. Our study is different in that it includes recordings of both men and women and both Black and White speakers and in that it focuses on a specific geographic region, thus minimizing variation due to regional differences that might be confounded with variation due to gender and/or ethnicity. We recorded the speech of 73 volunteers from Mississippi, making sure to recruit similar numbers of volunteers from different regions and/or cities in the state. The study included 19 Black female speakers, 15 Black male speakers, 20 White female speakers, and 19 White male speakers, all of whom fell within the age range of 18 – 22. This allowed us to directly compare the speech of women and men as well as Black and White speakers within Mississippi. 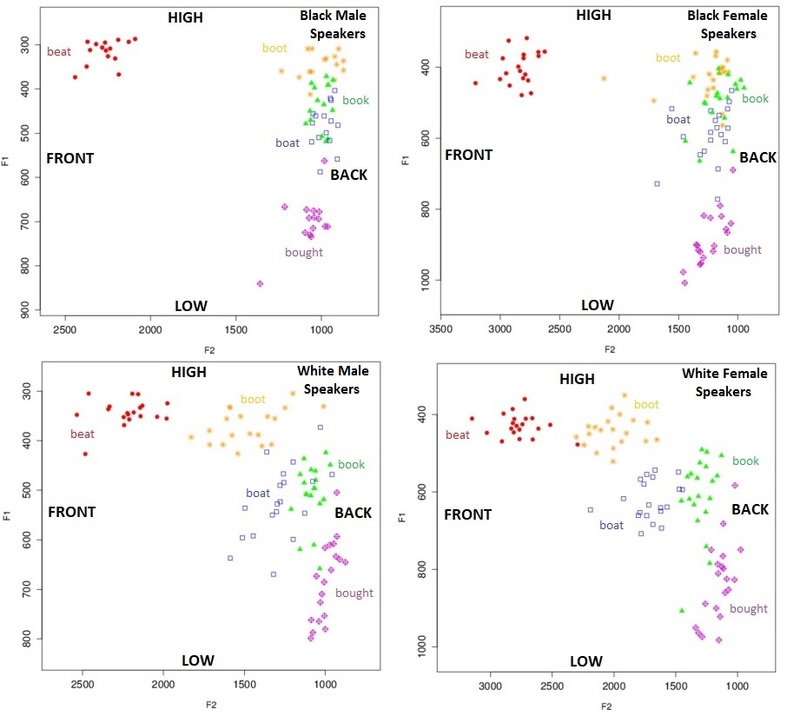 As can be seen in Figure 2, we found that speakers who identified as White were much more likely to front their back vowels in boot and boat than speakers who self-identified as Black. However, we did not find any gender differences. With the exception of one speaker, women who identified as Black were just as resistant to back-vowel fronting as men. Likewise, men who identified as White were just as likely to front their back vowels as women. Figure 2. Scatterplots of vowels produced in boot (yellow), boat (blue), beat (red), book (green), and bought (purple) by Black male speakers (top-left), Black female speakers (top-right), White male speakers (bottom-left), and White female speakers (bottom-right). Each point represents a different speaker. The words beat, book, and bought as well as the labels “high,” “low,” “front,” and “back” were included to illustrate the most front/back and high/low points in the mouth. Why do Black speakers and White speakers pronounce the vowels in boot and boat differently? Speakers tend to pronounce vowels – like other speech sounds – the way others in their social group pronounce those sounds. As such, pronouncing a fronted /u/ or /o/ could be perceived as a cue that tells listeners that the speaker identifies with other speakers who also front those vowels, in this case White speakers and vice-versa. Note that while back-vowel fronting might be associated with a more feminine identity in other regional dialects, that may not be the case in Mississippi because we found no gender differences. Finally, to learn more about how we use back-vowel fronting to align ourselves with social groups, it is necessary to look at the perception of fronted back vowels by speakers from different groups as well as to look at the degree of back-vowel fronting that occurs during spontaneous speech. What do you think? Do you front your back vowels? Can you hear the difference in the recordings above? Fridland, V. 2001. The social dimension of the Southern Vowel Shift: Gender, age and class. Journal of Sociolinguistics, 5(2), 233-253. Clopper, C., Pisoni, D., & de Jong, K. 2005. Acoustic characteristics of the vowel systems of six regional varieties of American English. Journal of the Acoustical Society of America, 118(3), 1661-1676. Holt, Y. 2018. Mechanisms of vowel variation in African American English. Journal of Speech, Language, and Hearing Research, 61, 197-209. Fridland, V. & Bartlett, K. 2006. The social and linguistic conditioning of back vowel fronting across ethnic groups in Memphis, Tennessee. English Language and Linguistics, 10(1), 1-22.